I visited Fort Kochi in May this year, and since I returned, you have been reading about it on the blog. After a long, ten part series, spread over three months, it is time I wound up my narrative, bringing my posts together for easy reference. Considering that I spent just a day there, the length of this series has been remarkable, so, what better way to do that, than summarize my 24 hours in Fort Kochi! Planning a trip to Kerala, we intended to stay at Cherai and make a day trip to Fort Kochi. That we stayed a night there, was only because I messed up the planning and booked our rooms at Cherai a day late! That left us with no plans for Samhith’s birthday, and, trying to do something different, I took up Lakshmi’s suggestion and booked a homestay at Fort Kochi! We spent just about 24 hours at Fort Kochi, arriving by the morning train and leaving for Cherai the next morning. Here is how we made the most of those 24 hours! Our homestay was an experience by itself. Talking to our host, or just relaxing amidst all the flowers… it was just what a stress-free vacation ought to be! We walked around the narrow lanes, admiring the cleanliness, reveling in the sight of the beautiful houses and ancient structures, and the small, local libraries which dotted the place! The Indo Portuguese Museum at the Bishop’s house showed us a glimpse of the original fort, and the grandeur of the churches which once stood within. The beach, with its unmistakable Chinese Fishing Nets, showed the other side of Fort Kochi – where the past seamlessly integrates with the present. The St. Francis Church, in all its simplicity, spoke of the days when Europeans first came to India. This was, after all, the first church built by them. It is also a reminder of the man who showed the world an easier way to get to India – Vasco Da Gama! The Santa Cruz Cathedral Basilica, on the other hand, with its simple exterior and stark interior, spoke of another time, and a desire to rebuild, magnificently, what had been lost! On the other side of town, the Mattanchery Palace spoke to us of the magnanimity of the Hindu rulers, as well as their love for art! Jew Town, and especially the synagogue, reminded us how peacefully religions once cohabited in India! A boat ride served to bring us back into the present, showing us the importance Fort Kochi has, as a port, and why it drew so many visitors, over the centuries! And the Maritime Museum told us the story of our Naval history down the ages…. 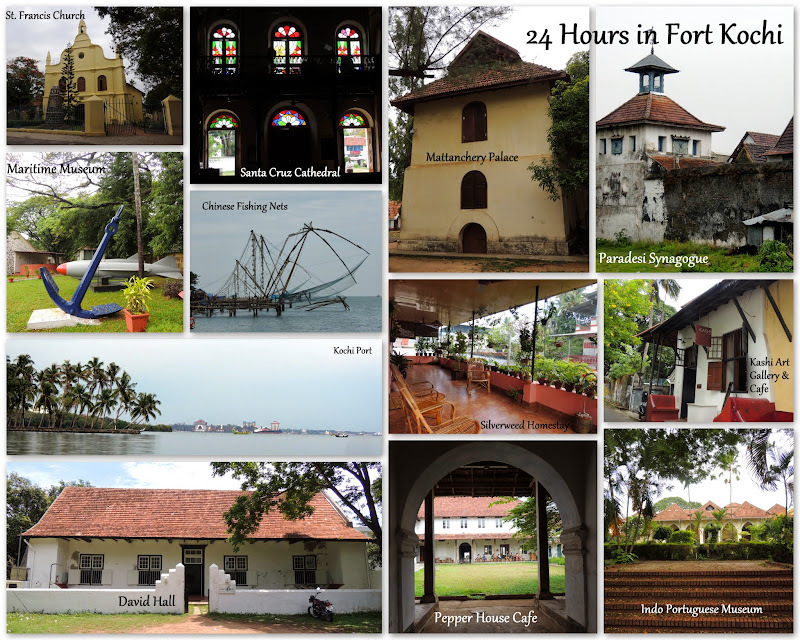 There is lots more to Fort Kochi than just these experiences. We, for example, missed visiting the ancient Jain temple, which would have completed our tour of ancient settlements here, and we also missed the Kerala Folklore Theatre and Museum. Apart from this, we couldn’t visit Willingdon island, or some of the other museums in the vicinity. However, these were probably the most memorable 24 hours we have ever spent, in any city! we certainly made the most of it! Besides, this is one city I shall surely visit again, sometime, at leisure! And this post turned me nostalgic!